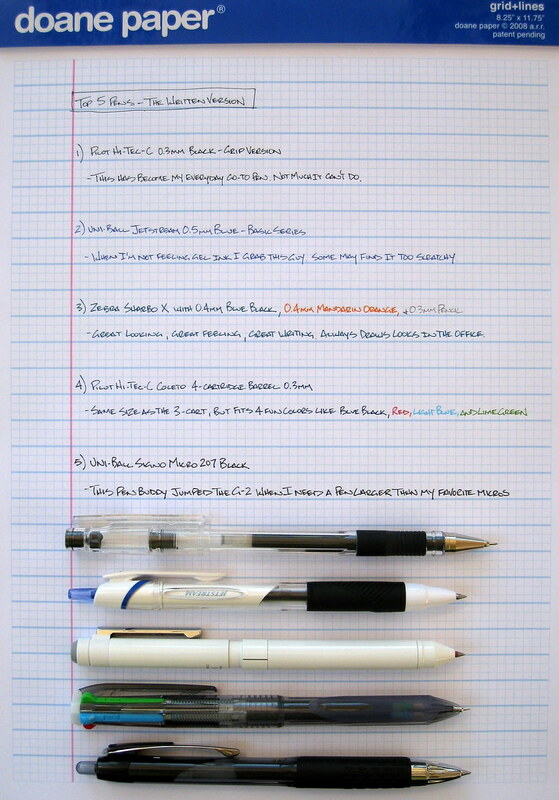 I never seem to update this list frequently enough, but here is a quick snapshot of the five pens I have used the most over the last couple of months. Any period of time longer than that becomes a blur, but at least this gives you an idea of what have been my go to pens recently. Plus it makes me realize that no matter how much I use a pen, I may not have reviewed the exact model I am talking about, so I will work on that as well. This is my everyday workhorse pen - as long as I have good paper to write on like Doane Paper or Rhodia. This tip size doesn't perform as well on "normal" paper, but I always keep the good stuff handy like any addict would do. Where the Hi-Tec-C doesn't fufill my needs, the Uni-Ball Jetstream 0.5mm usually does. Quick hit notes and a retractable tip are its specialty, and I love the 0.5mm width, which is admittedly not for everyone. This pen really classes up the joint with its sleek barrel design and smooth functionality. I have this white barrel model loaded up with blue black and mandarin orange 0.4mm gel ink cartridges, plus an 0.3mm pencil cartridge. I haven't done a proper review of this particular barrel, but it is my new favorite Coleto style. I love all things Hi-Tec-C, and I use this multi color model when I am working on projects or notes that I need to annotate more than with basic black. This pen is back in my good graces after falling out a year or two ago. I felt the micro tip wasn't a consistent enough writer (especially in blue), but I've given it another spin and I find myself using it a lot. Posted on June 10, 2010 by Brad Dowdy.